Atheism: Proving The Negative: Debate: Does God Exist? Last week, Russell DiSilvestro and I debated the existence of God for an audience of a couple hundred at California State University, Sacramento. Here's a link to a video of the discussion. Russell presented a form of the moral argument: roughly, he argued that the objective value of honesty as a virtue implies that there must be a God. Such moral facts cannot be explained as well by any other natural or supernatural hypothesis. I presented an argument from divine hiddenness for atheism. That is, if there were an almighty, all knowing creator of the universe who sought our belief on the basis of evidence, then the evidence would be much better than we find it. The evidence we find is poor, and there are countless people with epistemically inculpable non-belief. God, if there were one, could have made non-belief epistemically culpable. Therefore, there is no God. We also offered objections to each other's arguments and considered a number of good questions from the audience. Hope you find the video interesting. What is a .rm file? It stands for Real Media Player, which is a rather crappy quality player if you ask me. Thanks for the video, Dr. McCormick. You performed well, & I like that you both chose a single argument for your respective positions for the debate. This format allows for a bit more depth & avoids the empty rhetorical tactic of firing off several shallow arguments in hopes that your opponent lacks the time to address each one. This is at least the 2nd time that you have debated Dr. DiSilvestro, so I assume that you must enjoy debating him, but part of me wonders why. I thought he performed well for a christian apologist, but not as an assistant professor of philosophy at a public university. Perhaps he is not in philosophy of religion. I find that he is very adept at implying or touching upon common (fallacious) apologetic stock arguments, all without explicitly raising them & thus exposing himself to the fallacies. He spent a great deal of time in the intro referencing (uncited) religious text, all under the pretense of providing a historical sketch of the development of natural and moral theology, but these references left me with the impression that he was really making an appeal to authority, all before he even addressed the question of the debate of whether or not a god exists, thus begging the question. He then makes the quite slippery move of implicitly denying a premise of the argument from divine hiddenness: that there is in fact honest, sincere & genuine failure to believe in the xian god. It is perfectly fair for him to deny that premise of your argument, but he needed to do this explicitly. Instead, he quoted one atheist who yearns to believe in an omnipotent caregiver and then disingenuously implied that this applied to all nontheists. 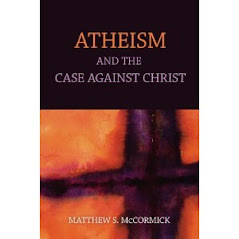 I think in the Q&A, he again, quite surreptitiously, commits an ad hominem, implying that not only do you, Matt McCormick, secretly know that yhwh exists & are in active rebellion against it, but in fact all atheists are engaged in an _emotional_ reaction against what they perceive as unfairness (us, the cucumber-receiving monkeys), rather than a reasoned consideration of the incompatible properties of the being proposed by theists. He goes much further and insinuates that your very objection & distaste for incoherent theistic sophistry is evidence for the existence of yhwh (if that’s true, one wonders what _couldn’t_ count as evidence for yhwh). The anger of atheists is proof that atheists are angry at someONE, a being. The point at which you were speaking of the hyperactive agency detection device would have been a great opportunity to raise this point. Theists may suffer from unjustifiably taking the intentional stance. There are ghosts in the machine everywhere. I think that GK Chesterton also argued that our human ability to feel gratitude, thankfulness, and joy in an undistributed fashion is evidence that there must be an unseen being for which these undirected emotions are truly directed. Dan Dennett spoke well of his yearning to “thank goodness” after his heart surgery, not as a euphemistic replacement of ‘thank god’, but as truly wanting to express gratitude for the ability of his doctors & of scientists to engage in goodness. I admit that sometimes when I stub my toe on an object, I will kick that object in my anger. When my computer freezes up, I will yell & strike it. This is an embarrassing admission because it is irrational to attempt to punish a nonteleological entity. The fact that I treat inanimate objects as possessing minds isn’t evidence that these objects possess minds. Have you had a chance to review the debate? What would you have added in hindsight? Thanks again.